Arthur A. Swallow Associates, LLC offers a variety of services to meet your land surveying needs. Our land survey and design is performed using the most current technology and methods in AutoCad, Robotics, and GPS. Our field crews utilize state of the art Global Positioning System (GPS), Robotic Total Stations and Electronic Data Collectors to complete any size project. We provide our clients with personal attention, ensuring that your project is completed on time and to your specifications. 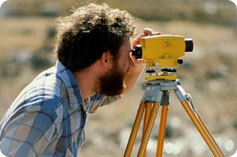 Land surveys are important and are made for several reasons. They can be made to determine the correct location of land boundaries with respect to deed descriptions. They can also inform you of the area of the land described, and any physical encroachments onto the property, or onto any adjacent property. They may also establish new lines dividing your land into smaller parcels, or represent the topography of the land. The field personnel employed by AASA have training in workplace safety and OSHA 40-Hour Certification for hazardous work sites. No property is too large or too small for our company. We provide the same standard of care for the urban residential lot as we do for a major tract. Each property is researched thoroughly before we arrive to make the required measurements. Markers are placed at corners and maps prepared as our final product. When a map or digital model is required for land planning or earthwork, we provide accurate data to represent the contour of the land as well as significant physical features, utilities and improvements. Map or models are prepared utilizing AutoDesk CAD software specifically programmed for the purpose. Contractors and builders rely on our abilities to interpret engineering drawings and produce stakeouts and cut sheets for all types of construction. Typically the work points and offset lines are computed in the office by our engineering technicians to minimize design problems that sometimes are discovered or encountered on the construction sites. Our response to a stakeout order is quick and often we are able to mobilize within twenty-four hours. Our firm has led the area surveying community by implementing Trimble real-time kinematic surveying routines. Our office personnel is well trained in the post-processing of GPS data when required. Currently we subscribe to a virtual reference station network so that real-time solutions can be obtained in an instant. The GPS technology has been used in our work to geo-reference mapping project and to establish vertical datum where no published benchmarks exist. Also, when it is necessary to locate and catalogue large public assets such as manholes, utility poles, valves and other facilities the data can be collected without optical observation so vast areas can be covered in a session. We perform land grading design for projects of all scales. Current regulations adopted by many suburban municipalities require professionally drawn plans for construction projects involving as little as 500 square feet. Our design staff is experienced in obtaining results for the residential needs as well as for large scale earthmoving operations. Current Federal, State, County, and Local regulations require analysis of increases in volume and rate stormwater runoff caused by the addition of impervious coverage to the land. Our design staff is expert in stormwater management methods and work with the landowner for the selection of the best management practice. Our company performs all the testing and design for sub-surface infiltration of stormwater. Where earthmoving or disturbance of the ground occurs in Pennsylvania, a plan is required to minimize and control the loss of soil caused by stormwater runoff. Our plans and reports are prepared to comply with jurisdictional regulations as well as the state manual. When a landowner desires to divide a property or to adjust a boundary line, no matter how minor, a subdivision plan is required to be filed with the municipality having jurisdiction. Typically, a boundary survey is required at a minimum and often because of regulations, topographic details are necessary. The subdivision is drawn and submitted with the supporting documents to the Planning Commission for review and recommendations to the governing body for final approval. After municipal approval and county review the plat is recorded in the county recorder of deeds office for future reference. When a new commercial building or facility is planned or an addition to an existing facility is desired, a land development plan is prepared and submitted to the municipal planning agency or zoning department for approval. Often, the land development is handled in a similar manner as a subdivision. The sewage disposal for any existing or proposed use, residential or commercial, must be handled by either a central or public collection and treatment facility or individually on the same property. We are able to work with the local enforcement agency in providing the testing and design that meets the state standards and regulations. As part of our surveying and design service, we can provide estimates of quantities such as stockpiles, excavations, utilities and improvements. Costs associated with the various operations can be assigned as estimates or as factual costs depending on the task. Often on large sites it is advantageous to the landowner to map the topography utilizing photogrammetric methods. Our company works with professionals who asist us in providing aircraft, cameras, and processing equipment to provide accurate details where ground surveying would be impossible or impractical. In order to relate a digital or optical image to the actual ground our surveying staff establishes horizontal and vertical reference points in order to interpret aerial image accurately. The EPA and PA DEP have determined that silt and sediment in stormwater runoff that leaves a construction site or occurs due to construction activity, is a pollutant and must be regulated by a permitting process. The completion of the notifications and application go hand in hand with stormwater management plans and soil erosion control plans. After construction of utilities, buildings or other improvements, the recording of as-built information is often required by a governing authority or as a good standard of practice. Our surveyors obtain the information from field observations and contractor's logs and produce maps or drawings that clearly represent the conditions. With over 35 years of experience in subdivision and land development, our company can provide guidance in obtaining successful results for residential or commercial projects. At times, a landowner may be interested in the potential of an existing tract or property. Our experience in the area of land development is valuable in the assessment of potential acquisitions or estates. There are many instances where a licensed professional is needed to furnish professional opinions or expert testimony in a survey or design matter. Our education, experience and registration allow our Professional Land Surveyors or Professional Engineers to present applications at Planning Commissions, Zoning Hearings, Governing Boards and Authorities. In legal matters that are placed in courts of law, we can provide valuable testimony as experts or prepare exhibits that a lawyer or advocate can use to present a case. Used mostly in commercial land transactions, an ALTA survey may be required by a lender or title insurance company in order to document the conditions of an existing property. The survey guidelines are specifically published in a document by the American Land Title Association in conjunction with the National Society of Professional Surveyors (a member organization of the American Congress on Surveying and Mapping). After approvals and permits have been obtained for a construction project, there is a need for experience and expertise in accomplishing the successful completion of a construction or land development project. Our company can provide whatever level of service necessary in order to obtain costs, contracts, scheduling, inspection, payments or anything else required with residential, commercial or municipal construction and development.